The author, Richard Carlson Jr., gave me a copy of this novel in exchange for my review. 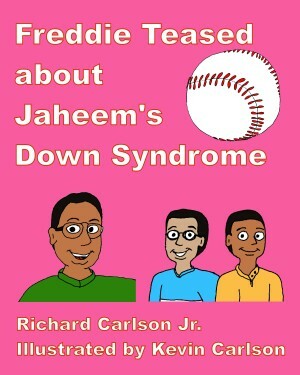 Freddie Teased about Jaheem’s Down Syndrome is a sweet story simply written. Freddie, a young man of undetermined age, knows that teasing Adisa about Jaheem would not be the nice thing to do. He knows a bit about Down Syndrome having researched with his mother after encountering a girl at school but seems to have viewed it in an impersonal sense. He’s never interacted really with the young woman. Carlson writes Freddie with a humanity and gentleness that will lead readers to hope that when their children find themselves in such situations they’ll reply with the same openness and humility. Carlson’s writing is more object lesson than heavy handed sermon and the affect on smaller children cannot help but be acknowledged. When 13-year-old Alex read the book she understood that the impact on Freddie should be shared by the reader. Kindness always is not a bad message but further to the subject, Carlson shows us the struggle of the person with Down Syndrome. Freddie can play ball all day but Jaheem must take care not to exert himself though he’s clearly eager to play. Some of the wording is stilted but not off base for early reader works. In one scene Freddie and Adisa are playing “toss” in the front yard. While regionally some of us might find “catch” a less awkward phrasing, the word only gave my 13 year old a moments pause. Kevin Carlson’s illustrations are simple but effective. Freddie Teased about Jaheem’s Down Syndrome is an early reader style book and the illustrations help readers visualize the characters. There is an illustration of an anatomically correct heart heading the expository paragraphs while a baseball mitt heads the active portion. Jaheem’s mother is shown with a kind and friendly smile. As serious as the topic is, the book in itself is light hearted and never cruel. We get the story from Freddie’s point of view and he’s a very open book when it comes to feelings. Freddie Teased about Jaheem’s Down Syndrome is a perfect classroom book to introduce young readers to Down Syndrome and universal thinking. Well written and well illustrated, young readers will find it an easy to follow and fun to read story. For more information about Richard Carlson Jr. and his work, visit his website. You can connect with him on Goodreads and Twitter @carlsonbooks.